Who’s Getting a Good Night’s Sleep? A student naps in the lobby of Bursley Hall at the University of Michigan in Ann Arbor. @DataLab538 would love to see mean night's sleep (Hrs) across USA (major cities, suburbs, and rural areas, too). It’s an important question, too. The Centers for Disease Control and Prevention (CDC) has classified insufficient sleep as a “public health epidemic,” citing a higher risk of “motor vehicle crashes, industrial disasters, and medical and other occupational errors,” as well as health problems such as “hypertension, diabetes, depression, and obesity” to name but a few. But the CDC’s survey data on sleep doesn’t include crosstabs — we can only say, for example, whether men sleep more than women and whether Californians sleep more than Texans, but we can’t say whether a man from California sleeps more than a woman from Texas. Alas, there’s no chance here of finding out whether Americans really are sleepless in Seattle. 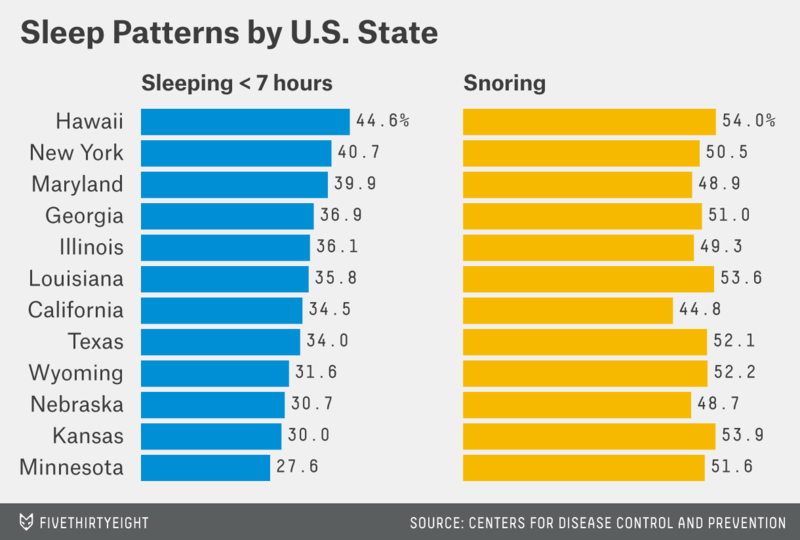 But there seems to be less snoring in California than in the other states surveyed. And Minnesotans apparently value their zzz’s. There is a 15.3 percentage-point gap between black and Hispanic Americans getting seven hours’ worth of sleep. Retirement appears to bring with it more sleep, but that highlights the problem of data broken down this way. Ideally, we would want to control for age to find out whether retirement changes sleep patterns. It’s not a complete picture, but the data shows that Americans tend to sleep less when they’re single or unable to work.